Mediterranean menu items that are meatless have proven to be popular at NewYork-Presbyterian’s retail spots. NewYork-Presbyterian (NYP), one of the nation’s most comprehensive academic healthcare systems, will be putting its dietary, science and research muscle to work with a new series of Meatless Mondays, slated to start in February at several NYP campuses. NYP has participated in Meatless Mondays in the past, but this is the first time they’ll be integrating it to such a big extent across hospital groups and beyond. A joint research study between NYP, Columbia University Mailman School of Public Health, Johns Hopkins Center for a Livable Future and the Monday Campaigns will be conducted to determine the influence of Meatless Mondays campaigns on consumer awareness and behavior in terms of meat consumption. “We hope that being part of this research will help other institutions see the relevance and value of moving toward plant-based offering,” says Kristen Mathieson, MBA, RD, CDN, project management lead at NYP’s Department of Food & Nutrition. “We are teaching patients, staff members, students and the community,” says Louise Merriman, MS, RD, CDN, administrative director of clinical nutrition at NewYork-Presbyterian. This is a step that makes sense for a healthcare operation that’s so strong in research, adds Hooman Yaghoobzadeh, MD, FACC, clinical associate professor of medicine at NYP and Weill Cornell Medicine. Other departments within the healthcare system are creating a synergy with the plant-based initiative. 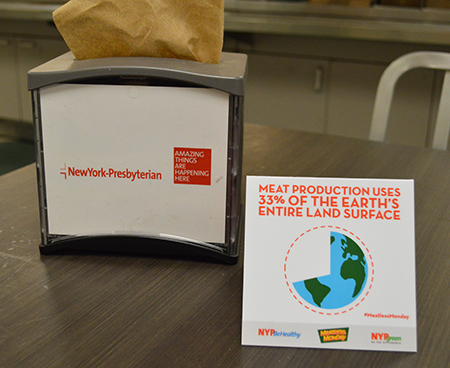 Along with the NYP nutrition department, the Health and Wellbeing team (NYPBeHealthy) and the Sustainability Department (NYPgreen) are working together to reach out to employees about going meatless more often. “Communication efforts are intended to educate employees on how small adjustments in meat consumption can reduce an individual’s environmental footprint as well as the risk of adverse health outcomes associated with high-meat diets,” says Monika Sheikh, NYP’s corporate sustainability administrator. NYP dietitians and the culinary team, along with medical students in the Culinary Medicine elective are creating new meatless menu items for the Meatless Monday program, and dietetic interns will gather data to see which recipes are the most successful. Those could end up on the regular menu. Along with beans and legumes, the culinary creations have included lots of veggies, whole grains and herbs and spices for maximum flavor impact. Current meatless menu items that NYP customers have been enjoying include falafel pita wraps, vegetarian chili, quinoa stuffed peppers, black bean soup, carrot-ginger soup, Jamaican corn chowder, black bean-sweet potato casserole, red lentil loaf, roasted veggie lasagna, a noodle bar and overnight oats.